Sirius includes powerful and easy-to-use business management software! 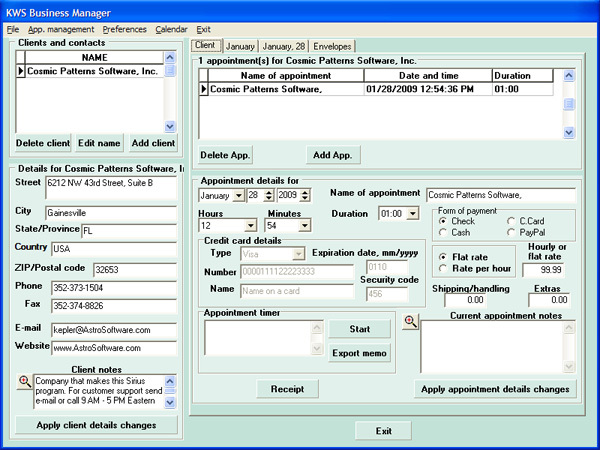 With the Business Manager, you can schedule appointments, browse through your appointment schedule to see what upcoming appointments you have, quickly read in the names of people whose data is in Sirius or enter names of new people, and maintain information about these clients, such as postal address, e-mail address, phone numbers, and notes. You can even print envelopes directly from Sirius manager to the printer. The Business Manager has an unlimited client notes, and current appointment notes area. Within the Business Manager's prefences, you can include the consultant's name, put your company name, set the currency to use, and set the % of taxes to collect. These information will later be on the generated receipt. Generated receipts can either be saved to file or printed.